The USS Massachusetts is one of four South Dakota-class battleships constructed in the 1930s. Built by Bethlehem Steel Company in Quincy, Massachusetts, the USS Massachusetts was launched on September 23, 1939, and commissioned on September 23, 1941. Measuring 681 feet in length with a 108-foot beam, and weighing 35,000 tons, the USS Massachusetts was the heaviest ship ever launched from Quincy, which quickly earned the battleship the nickname, "Big Mamie." The USS Massachusetts carried a 2,300-member crew during wartime. 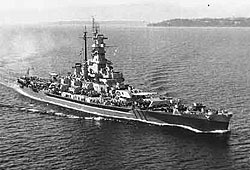 The design of the South Dakota-class battleships was influenced by the Washington Treaty signed in 1922. The agreement among the United States, Britain, Japan, France and Italy limited the absolute tonnage of battleships to 35,000 tons and set up a ratio of ships among the major naval powers. The USS Massachusetts is representative of the South Dakota-class of American battleships that fought against Japan in World War II. The battleship is evidence of America's continued preparation for the war and for the development of a more advanced battleship design. "Big Mamie" played a significant role in World War II. Beginning in November 1942, the USS Massachusetts saw action in Pacific and European operations. The battleship fired the first 16-inch American projectiles of the war, as well as the last. Over the course of the war, the USS Massachusetts sank or damaged five enemy ships and shot down 39 aircraft, earning 11 battle stars for its wartime service. Following the war, the vessel returned to the United States and operated with the Pacific Fleet until mid-1946 when it was decommissioned. In 1962, the USS Massachusetts was stricken from the Navy Register, ordered sold for scrap and some 5,000 tons of equipment was removed for use on other naval vessels. Its wartime crew—with the help of Massachusetts school children—raised sufficient funds to bring it to Battleship Cove in Fall River, Massachusetts. The battleship opened to the public two months later. The USS Massachusetts, a National Historic Landmark, is located at Battleship Cove as part of the museum's historic vessel collection. Battleship Cove is located at 5 Water St. in Fall River, and is open to the public throughout the year for a fee. The times change slightly from season to season, and Battleship Cove is closed on Thanksgiving Day, Christmas Day and New Year's Day. 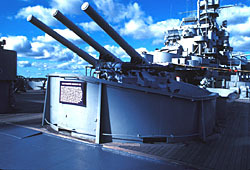 For up-to-date information, please call 508-678-1100 or visit Battleship Cove's website.